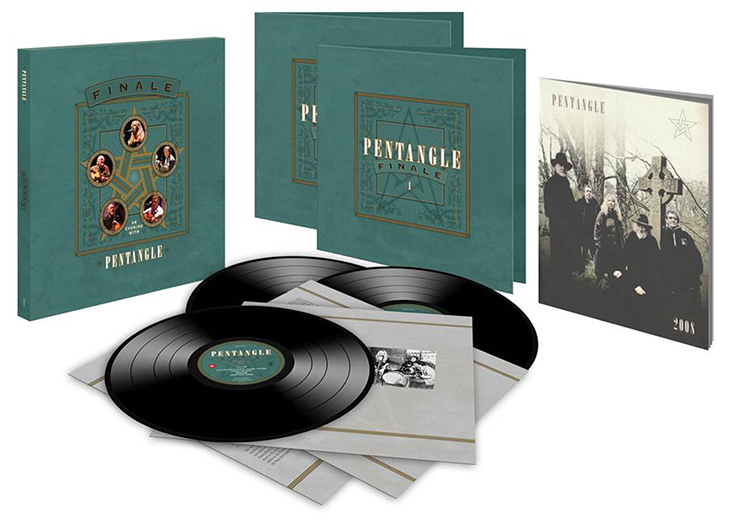 For this years Record Store Day (on the 22nd April) we’re releasing, in association with Vinyl 180, a beautiful 180g triple vinyl version of Pentangle’s Finale. This Limited Edition pressing of 500 copies for Record Store Day, sees ‘Finale’ spread across three 180g vinyl discs. Packaged in newly designed inner bags and comes in two deluxe gatefold sleeves, the second sleeve holding the third disc and a original copy of the programme from the historic 2008 tour. Completing the set the sleeves are packaged in a Hardback Casebound Slipcase, making a truly magnificent collectors piece. Respected music journalist and long time fan Peter Paphides provides a fascinating insight into the significance of these recordings by contributing sleeve notes specially commissioned for this 3LP set. Finale was recorded live during the 2008 tour and sees the original line-up revisit their classic repertoire, a career retrospective for the halcyon years 1967-73. Pushing the boundaries in many ways, history has acknowledged Pentangle as one of the most exciting and innovative combos in the folk world, who’s influences have been at the forefront of the folk-jazz scene. Eternally relevant and cutting edge, the like of which we are unlikely to see again.